Once warmer weather returns, and the days start to grow longer, the garden tempts up back into it, after a winter of rest, perhaps buried beneath snow. The early-spring garden can look sad, and some early work will pay dividends, as well as getting you out in the fresh air and spring sunshine. 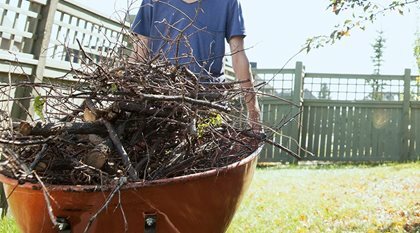 Here are some tips to bring your garden back into shape effectively and set you up for a great year. The rule is, prune summer and fall flowering shrubs in spring, and spring flowering shrubs in fall. So spring is the time for panicle hydrangeas, buddleia, crape myrtle, roses, and any other shrubs that flower later, at the end of new shoots formed in spring. Lilac would be an example of a plant you don’t want to prune in spring, because they flower in side-shoots from last year’s branches. Spring pruning is best done when the buds are just beginning to swell, which makes it easier to see where to cut and what to take away. Start by removing all dead and spindly growth, leaving a strong, open framework. Then shorten back the shoots that grew last year, to just above a bud. How much you cut back, especially with plants like panicle hydrangeas, will control the quantity and size of the flower clusters. Cutting back hard gives big heads, but fewer of them. Light trimming gives more heads, but smaller ones. Most of the time a moderate trim, removing about one-third of the growth, is the best middle path. Fertilizing the lawns is a spring tradition, but trimmed hedges are like vertical lawns – they do need nutrients to replace all that growth you cut off them last year. Other evergreens, even if they aren’t trimmed regularly, also benefit from feeding, they will grow more densely, and with rich-green foliage. Pick up a fertilizer blended for hedges and evergreens and follow the instructions. Water-soluble is best for new plants, and granular for older ones. Newer slow-release forms only need one application a year, so once done, that’s it – a big time saver. Spring in the garden is a time of renewal and development. Older plants may have reached the end of their attractive life, a bed may need an overhaul, or some plants simply haven’t done what you expected of them. This is a great time to bite the bullet and remove them. Now you can have the fun of looking for something new and better for those spaces and going shopping. With online services, and often free delivery, you can avoid the crowds at the garden center, access the latest varieties, or old favorites, and save time. To a gardener there are few things more exciting than having a truck turn up at the door with a new tree, or a shipment of new shrubs. Go ahead – treat yourself and your garden at the same time. Fresh mulch in spring really makes your beds look like you care. The best materials are compost, rotted animal manures, or mushroom compost – available if you have a mushroom growing operation nearby. These richer materials rot down more quickly, but they feed your soil and plants in the process, so that over a few years you get much better soil, and your plants grow and flower so much better too. You save on fertilizers, as richer mulches replace them the natural way. Bark chips and gravels can look nice, and they conserve moisture, but they don’t do anything for your plants or soil, so save them for areas where they fit the design. Reducing the length of the new shoots on pines is called ‘candling’ by knowledgeable gardeners. It is the best and easiest way to keep plants like Mugo Pine, dense and compact, since cutting older stems usually leaves them unable to re-sprout. It easy to do. When the new shoots have grown up, but before the needles start to grow out, cut them back, or pinch them with your fingers. The hand method is quicker, and doesn’t cut any needles, but you will need to clean sticky sap from your hands when you have finished. You can take just a little off, which is useful when you still want them to grow taller, or almost the whole stem, just leaving an inch or even less of new growth. The remaining needles will lengthen normally, and several new buds will form for the next year, so you get a denser, more compact plant. On larger pines this is a great way to get a more Asian look, with spreading, flat branches and dense foliage – a sort of in-the-ground bonsai. If you didn’t do all your leaf raking in fall, it should be job number one in spring. Many leaf diseases, including apple scab, rust, rose black spot and mildew, are carried from one season to the next on fallen leaves. Leaves from trees and shrubs that are susceptible, such as crab apples, lilacs, roses, crape myrtle, and others you might have had problems with last summer, should be picked up, even if they are not an eye-sore. Usually if they are properly composted the heat will destroy any spores, but if you leave them lying around, they will release spores as soon as the temperatures rise and re-infect vulnerable plants. Even if you have planted resistant varieties – and that always pays if they are available – the heavy release of spores can be enough to cause some effect, since ‘resistance’ is not ‘immunity’. Don’t Forget Your Planter Boxes! If you have shrubs in planter boxes and pots, they will really appreciate some fresh soil. If you can slide the plant out, trim the roots a little, replace the soil, and replant. You will get much healthier growth, especially if they have been in the planters for more than two years. If you can’t take them out, scrape away all the loose soil from the top of the planter, and remove it. Replace with fresh soil, and don’t forget to add some fertilizer too – plants in pots should be fertilized regularly.